Ideal for the romantic at heart, rose quartz engagement rings have become a popular choice in recent years. This semi-precious stone is known for its symbolism as a warm, comforting and protective crystal. With its cloudy pink hue, it works well with platinum, white gold, yellow gold and rose gold. This stone can be included as a side stone alongside a diamond or used as a centre stone. 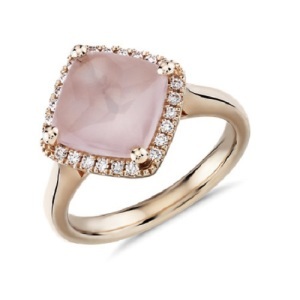 Join us today as we take a look at some of the loveliest examples of rose quartz engagement rings to help you find a little bit of inspiration for your dream ring. With its classic round cut centre stone, which is surrounded by a halo of tiny pave diamonds and set in a simple rose gold band, this ring is feminine, romantic and classic. Round cut stones are flattering to fingers of all shapes and sizes. The halo around the stone adds extra sparkle in a subtle way, without detracting from the softness of this ring design. This style would work just as well in any other metal. 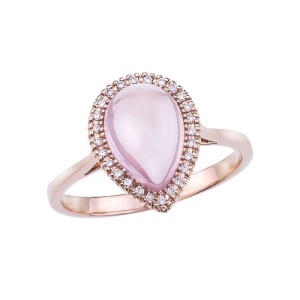 You could also use rose quartz for the halo, with a diamond in the centre. For something different, this cushion cut stone lies at an angle. This style is also sometimes known as an east-west cut, as the four angles face in different directions. Although the halo adds extra sparkle, this ring could also be kept simple, with just a few pave stones on the band. 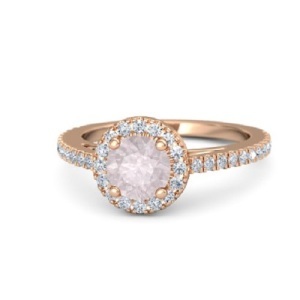 Like the ring above, you could mix things up by changing metal or swapping the centre and pave stones around so that you have a diamond as a centre stone and tiny rose quartz stones as pave side stones. A delicate, tiny baguette cut stone enhances the simplicity of this ring, which features a pave encrusted split band design in platinum or white gold. Although a baguette or emerald cut stone works well, you could choose any cut for this ring – round, oval, trillion, cushion, pear or even heart would also work well. Whether you add pave stones in the band or kept it simple, this is a ring that will never go out of fashion. For brides who favour a more modern style, stacked rings are versatile, minimal and delicate. You could stack your wedding and engagement ring, and add an anniversary ring or even a promise ring. When each ring is slightly different in style, the result is a diverse ring that can be stacked in various ways. Rings can also be worn individually if you are in the mood for something more subtle. Another example of a minimal ring is this oh-so-delicate trillion cut ring in an equally delicate setting. This ring works well in yellow gold, which adds just the right amount of contrast to add visual interest. It would work just as well in platinum, white gold or rose gold, however. If trillion cut is not your thing, you could try a similar ring in a round cut, square cut, heart cut or marquise cut. 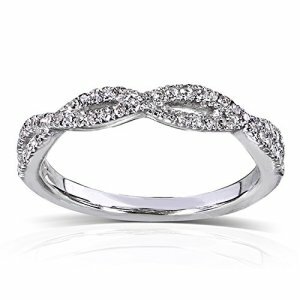 For those who favour a more classic style of ring, this gorgeous pave pear has plenty of sparkle. Pear cut rings are flattering and elegant. They can be worn with the point facing up or down, which can elongate or reduce finger size respectively. Whether enhanced with pave stones or kept as a similar solitaire ring, the style of this ring is classic and sophisticated. 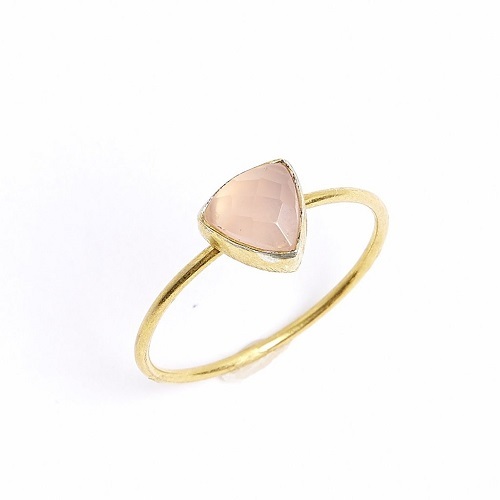 While rose quartz is not a stone that resonates with every bride-to-be, it has a simplicity and honesty that makes it an understated option for those who are not too fussy about precious stones. Here at Cape Diamonds, our role is to make your engagement dreams come true. If you'd like help planning a custom engagement ring in Cape Town, get in touch with us today and let us help you plan the ring you've always wanted. Buying engagement rings is no small challenge. For those planning to surprise the love of their life with a ring, the process is especially daunting. Over and beyond planning the proposal, you need to first find and purchase the perfect ring. Luckily, knowing what to expect when shopping for engagement rings can make things a lot simpler. If you are preparing to pop the most important question of your life, make sure that you have a look at these not always well-known truths about buying engagement rings. 1 All diamonds look the same at a glance. After a while, it becomes even harder to tell the difference between a high carat stone and a low carat stone. Round and oval cuts will start to look very similar, baguettes and emerald cuts will blend into one another, you will not be able to spot tiny flaws and you may even develop a bit of a headache from peering at a non-stop supply of diamonds. This is where your jeweller comes in to help make the process easier. A good jeweller will be able to find the best quality diamond for your budget and offer a selection of cuts that suit your requirements. 2 Your personal preferences do not count. Keep your own personal preferences aside when looking at rings. It does not matter how much you prefer platinum to rose gold. It matters that your love has a penchant for rose gold jewellery and a love for diamonds. This ring is a piece of jewellery that is made to be treasured for the rest of your partner's life. If she is not 100% happy with the ring, she may have to get it altered or she will otherwise have to settle for a ring that is not exactly her style. Needless to say, neither of those scenarios are ideal. 3 Your partner's friends are a source of valuable information. 4 Asking for your love's hand in marriage can be awkward. If you are the traditional type and you plan to ask your love's parents for their blessing, prepare yourself for a rather awkward experience. No matter how long you have been dating their daughter and no matter how much of a good relationship you have, asking parents for their child's hand in marriage is not always a situation that is without a few blushes and nerves. 5 Generic mass-produced rings are not worth considering. Whatever you do, make sure that you take the time and effort to find your love a ring that can be completely hers. As tempting as it may seem to go to the nearest chain store to find a ring, mass-produced rings are never ideal. These rings are almost always generic, with thousands cast from the same design. A custom made ring is unique, with the ability to change small details to suit your love's tastes. It will be treasured on a far deeper basis than any generic ring could ever hope to achieve. Find your dream ring with the help of Cape Diamonds, which offers a wide range of premium, custom made engagement rings handcrafted in Cape Town. Braided engagement rings come in a variety of shapes and sizes. From simple twisting designs all the way to plaited bands and two tone twists, these rings are soft, feminine and gorgeous. They are also deeply romantic. Due to their interconnecting nature that creates an eternal loop, these rings often symbolise the endless journey of love, as well as the twists and turns that every relationship will take along its path. If you have been dreaming of a braided engagement ring, keep reading to get inspired by these spectacular rings. 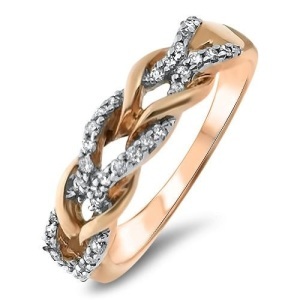 This delicate pave infinity braid integrates the braid as part of the design. 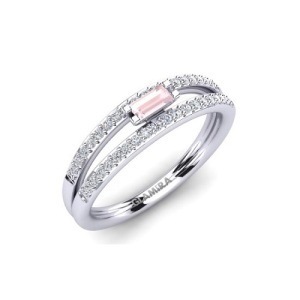 This ring would also work well as a wedding band or even a promise ring. For those who prefer a more subtle style, the gentle twists of the braid are given extra sparkle with the addition of tiny pave diamonds. 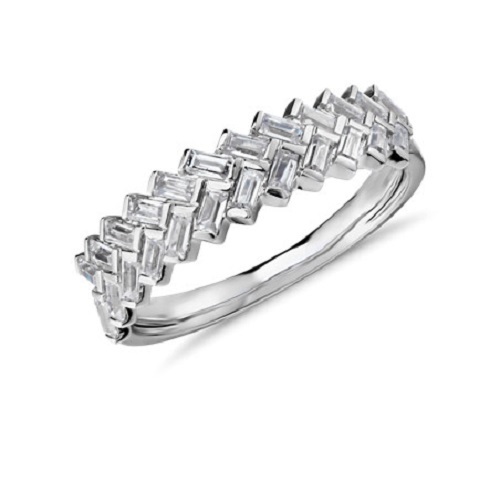 This ring works well in platinum and diamond, but could also work in yellow or rose gold with white or coloured diamonds. 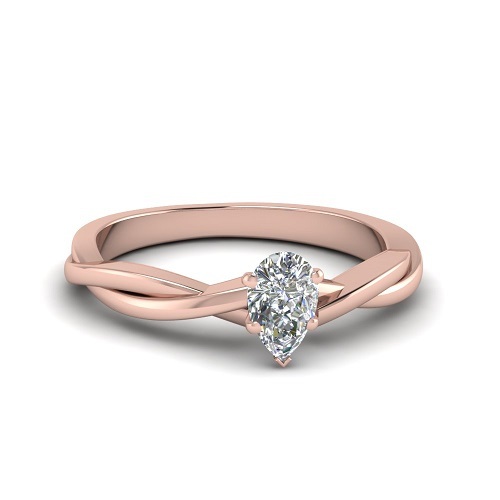 Even more minimal is this understated rose gold band with a small pear shaped diamond in the centre. 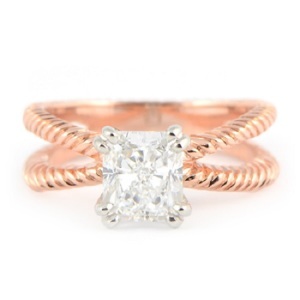 This style works well in rose gold, and could also work equally well in white gold, yellow gold or platinum. The tapered shape of the pear cut stone is feminine and pretty, working well with the gently twisted braid of the ring's band. 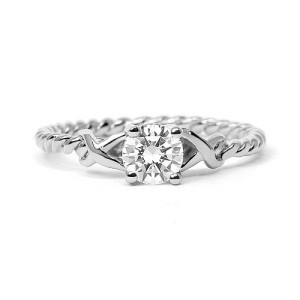 For those wanting something simple, that is not too understated, another alternative is this simple and classic braided ring that features a plain braided band and a solitaire diamond in the centre. This ring is versatile and elegant, working well with just about any type of stone and in any metal. You could add impact by making the braid two tone in rose gold and platinum, or try a coloured diamond instead of a classic white diamond. This unusual ring features tiny baguette cut diamonds rather than traditional pave stones. The result is a braided effect that looks simple from a distance, becoming more ornate the closer you look. For those who prefer minimal styles and gender neutral designs, this ring is sure to impress. 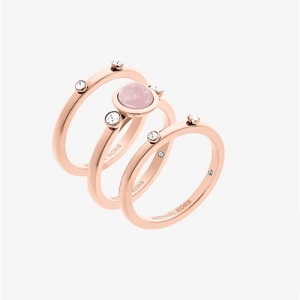 It would work equally well in a warmer toned metal such as rose or yellow gold. The interlocking braids of this ring alternate between solid rose gold and pave twists, with an effect that is almost like a knit stitch. The effect is eye-catching without being over the top. To make this ring more subtle, you could try a platinum band rather than a warmer toned metal. To make it more elaborate, you could try coloured diamonds instead of classic white diamonds. The split shank design is a classic choice that continues to attract brides-to-be. Symbolic and flattering, this style works well with a double braided band. 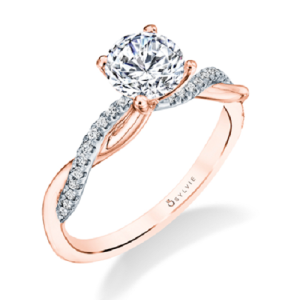 A simple cushion or square cut solitaire adds the final touch, providing balance and a central focus. This ring would look beautiful in any metal, using any stone. Two tone rings are also popular and for good reason. Pave offers a way to add contrast in a subtle way, offsetting the warm tones of the delicate rose gold band. The gentle twists of this braid add interest without going over the top. A simple solitaire in a square, emerald, round or oval cut further adds to the impact of this ring, making it romantic yet classic enough to suit those who favour traditional styles. 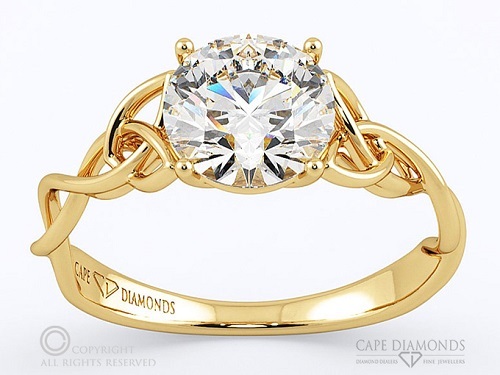 Deeply romantic and symbolic, the Cape Diamonds Celtic ring in yellow gold is a true show stopper. Here's what this ring has to offer: “A dazzling handcrafted piece of yellow gold and diamond jewellery with Celtic flair, an incredible designer diamond ring for women. 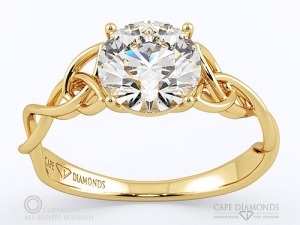 Starting with yellow gold band with a Celtic knot that stretches around and up either side of a 4 claw setting clenching a flawless round cut solitaire diamond.” This ring is exclusively available to Cape Diamonds. 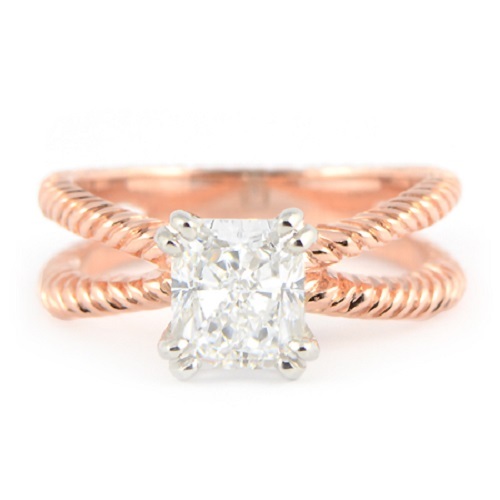 However you decide to bring in braided detail to your engagement ring, you are sure to find your dream ring once you start to unleash a bit of creativity and inspiration.